This is the 7th post in series called The Tech I Use. If you would like to see the comprehensive list of technology I use click here. Square Cash is one of my favorite new services! It allows a person to quickly and easily send money to someone else through the internet for free. You don't have to sign up for anything, you just send an email. I have been using Square Cash since it launched in October and I have used it to send money to family members and friends. It is so easy to use and the money arrives in the other person's checking account one to two business days later. Everyone that I have sent money to had no clue that I was going to send them money via email and they all were impressed with how easy the process was and how quickly the money arrived. In the example below I sent my wife $1 to her checking account (we share our main account but she still has one from before we met). Draft an email with the recipient's email address in the "To" field. Enter cash@square.com in the Cc field. Enter at least $1.00 in the subject line. For example: $10. Add a note in the email body to inform the recipient why you are sending Cash. If you haven’t sent or received Square Cash before, you will be prompted to link a debit card. It takes about 90 seconds to connect your debit card and you never have to do it again! Once added, your cash will be sent and you'll see the "Cash Sent" confirmation screen. The recipient will receive an email from you and a couple minutes they will receive an email from Square prompting them to deposit the cash in their checking account. The recipient is taken to Square's secure website where they enter in their Debit Card Number, Expiration Date, Zip Code, and CVV. Once you have completed the process, you will see a confirmation screen explaining that the money will appear in your checking account in one to two business days. For people unfamiliar with Square, they have been in business since 2009 and are most famous for the Square credit card swiper that you see people use with their smart phone or tablet to process credit card transactions. They are now processing over $5 billion every year. Square takes security very seriously. They use encryption and are compliant with PCI Data Security Standard (PCI-DSS) Level 1. Here is a blurb from the Square Cash Security webpage. I would encourage you to try out Square Cash next time you owe someone money! I am going to start encouraging my clients to pay me with Square Cash since most people still pay me via check and Square Cash draws the money right from your checking account. Square Cash only requires email to use, but they have a nice app for iOS and Android. If you want to try sending someone $1 to test it out feel free to send it to my email address and I will send the $1 back to you. This is the 6th post in series called The Tech I Use. If you would like to see the comprehensive list of technology I use click HERE. Taking out the trash and recyling bins every other Tuesday. Paying my American Express bill each month. Approving my timesheet every other Wednesday at the church I work at during the summer. Paying various student loans each month. Replacing tooth brush every three months. Buzzing my hair every six weeks. Buying birthday gifts for family members once per year. Buying tickets to a show we like at Apple Valley High School once per year. In the past, I would find myself forgetting to do one of these things. The real important items like paying bills were never forgotten, but the random things like replacing a tooth brush or buying a birthday gift for a family member would often get lost in the shuffle (it's not because I am forgetful, it's because I am really busy or at least that is what I like to tell myself). I discovered an app called Due. 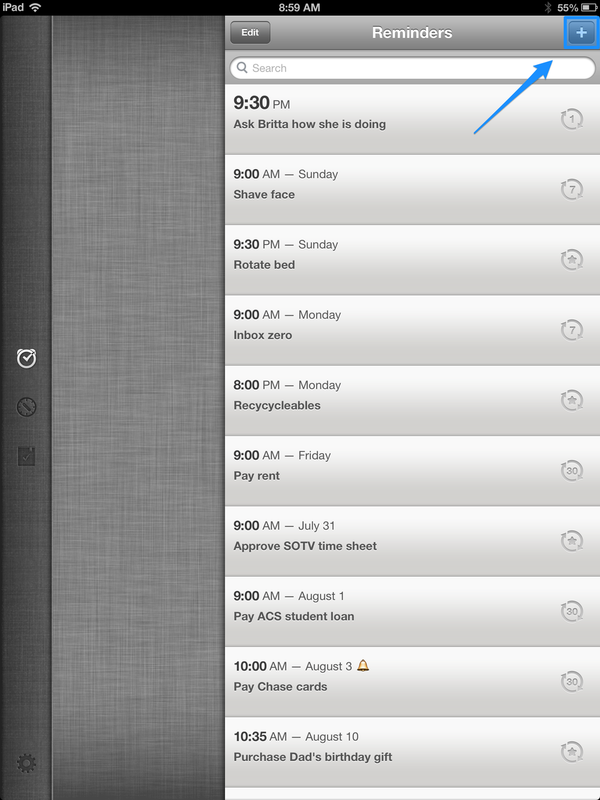 Due allows me to set up reminders for tasks that have to be done over and over again. This is what Due looks like on the iPad. I choose not to put these types of tasks on my calendar because I like to reserve the calendar for appointments, classes, and other events that have a strict time frame. I choose not to use the built in Reminders app in iOS for these types of tasks because it doesn't offer as much flexibility. Setting up a new reminder is very easy in Due. You tap on the + sign in the upper right hand corner. You type in a title for your reminder and choose a time for Due to alert you. If you would like the reminder to repeat itself, you can choose how often the reminder will repeat itself (daily, weekly, first Monday of every month, yearly, etc). By default, DUE repeatedly notifies you of overdue reminders every minute with its auto snoozing feature until you mark them complete, reschedule them, or turn off their auto snooze. You can change auto snooze to remind you every hour. I set auto snooze to keep reminding me every minute for time sensitive things like taking out the trash & recycling bins (the constant buzzing and noises coming from your device prompts me to take action). For things that are a bit less time sensitive (like rotating the bed), I typically set auto snooze to remind me every hour. Note: You can turn auto snooze off if you want. You can also customize the sound that each alert makes. Perhaps you want to have a more obnoxious sound for the more time sensitive tasks so you are motivated to take care of the task sooner. Some people like to use different tones to indicate works related reminders compared to home related reminders. If your iPad buzzes while you are at the coffee shop with a friend reminding you to replace you tooth brush you can postpone the reminder by tapping on a button. You can postpone reminders by 10 minutes, 1 hour, or 1 day. Due is an Universal app which means that you can purchase it once and use it on both an iPhone and an iPad. You can sync your reminders via iCloud. Due cost $4.99 and has been instrumental in helping me not forget stuff. As we start to close out 2012, I figured I would share some of my favorite blog posts that I have written this year. Over 100 people now receive my blog posts via email and there are over 450 unique visitors to my website each month. Hopefully, this gives people who missed some of these blog posts the first time that they were published a chance to catch up! Check out Part 1 of Mike's Favorite Blog Posts of 2012 if you missed it! In these blog posts it is my goal is to show you how to do some neat stuff in 30 seconds or less! In these blog posts I share a piece of technology that I personally use. David Sparks over at MacSparky has been doing this for a long time and I thought it would be interesting to ask my friends, family, and former co-workers what is on their Home Screens! The name says it all. Some random topic that I thought was worth writing about! As we start to close out 2012, I figured I would share some of my favorite blog posts that I have written this year. Over 100 people now receive my blog post via email and there are over 450 unique visitors to my website each month. Hopefully, this gives people who missed some of these blog posts the first time that they were published a chance to catch up! In these blog posts I share various articles, websites, and apps that I found interesting in the previous week. This is the 5th post in series called The Tech I Use. If you would like to see the comprehensive list of technology I use click here. For a long time I have wanted to go "paperless", but I have never quite figured out the right workflow. Scanning stuff with a typical scanner is too time intensive and I never really wanted to invest in a special scanner for scanning receipts and business cards. I recently discovered Scanner Pro by Readdle. This app has changed the game for me! Using the camera on your iPhone or iPad you take a picture of a receipt, document, business card or whatever else you want to scan and it intelligently selects the edges of the document and saves it as a PDF file. You can scan multi-page documents and add, move, delete, and even combine pages. Scanner Pro has built in support for iCloud so you can sync your scanned documents to your other iOS devices. They have recently added support for Dropbox, Google Drive, and Evernote. You can email a scanned document as well as print it via an AirPrint printer. For that random situation where you need to fax a document to someone you can scan it with Scanner Pro and fax through the app. It's crazy cool! Note: I have not tested the fax feature because I don't even know who I would fax something too. This is an extremely easy to use app that has allowed me to quickly scan receipts and all other random sheets of paper that I don't want cluttering up my pockets and my desk. I would highly recommend it at it's normal price of $6.99 (that's what I paid). If you are reading this blog post on August 1st or August 2nd you can snag it for $1.99 because it's on sale to celebrate Readdle's 5th birthday. Grab it now in the App Store! This is the 3rd post in series called The Tech I Use. If you would like to see the comprehensive list of technology I use click here. I am a huge proponent of backing up your data. On my MacBook Pro I have priceless photos (wedding, honeymoon, world travel), important documents (résumés and taxes), and things I would rather not lose (fantasy football spreadsheets, various notes, etc.). I use Apple's built-in Time Machine application to make sure that I don't lose anything. While working at the Mall of America, I can't tell you how many people that I talked to who told me that they intended to backup their Macs but never got around to it for one reason or another. Apple knew that the majority of their customers weren't backing up their Macs so they decided to make the process easier. In the fall of 2007 Apple introduced Time Machine with Leopard. Time Machine is installed on every Mac sold since that time. Time Machine is the best new feature in Leopard, perhaps the best feature ever added to Mac OS X. Put simply, Time Machine is a backup and recovery system that people will actually use. It effectively cuts the Gordian Knot of the age-old backup dilemma for normal users: "I know I should back up, but I never do. I wouldn't even know how to do something like that anyway." Well, enough of that. To get started with Time Machine you first need to have an external hard drive. You can pick one up at Target, Wal-Mart, or Best Buy. If you want to order online and help me make a couple bucks I would recommend one of the following hard drives from Amazon. Once you have the external hard drive all you need to do is plug it in and a dialog box will pop up asking if you want to use the hard drive to backup your computer. The first backup will take awhile (potentially a few hours) depending upon how much stuff you have on your computer. After the initial backup, it should only take a few minutes. If you have a Mac that sits on your desk all day I would encourage you to keep your hard drive plugged in all the time. Time Machine will backup any new files every hour. If you have a laptop I would encourage you to plug in your hard drive at least once a week. One of the neat things about Time Machine is that you can "go back in time". You can edit a document and a few months later retrieve a previous version if you need to. If you accidentally delete a file you can also go back and retrieve it. Time Machine is a fantastic technology that makes your life easier and should be able to save you in case of a crashed hard drive or accidental data loss. This is the 2nd post in series called The Tech I Use. If you would like to see the comprehensive list of technology I use click here. About a year ago I was reading an article over at Mark's Daily Apple titled How Light Affects Our Sleep. The key takeaway for me was the effect that blue light can have on a persons sleep. Blue light from electronics can interfere with our ability to fall asleep especially in today's world where many of us are using our computers late into the evening. One of the suggestions at the end of the article is to install F.lux (totally free) on your computer to cut down on blue light emissions. After reading the article I installed F.lux on my MacBook Pro. F.lux automatically changes the color temperature of your display. During the day your computer will look completely normal. When the sun sets at night your computer display will take on a different tone. F.lux is very easy to set up on your Mac or PC. Visit F.lux's website to download and install. The first time you open up f.lux it will determine your location. Once f.lux has determined your location than you can adjust what the color temperature will be at night and during the daytime. For night I personally have chosen Tungsten (2700K) which is the option that produces the least amount of blue light. During the day I have chosen Daylight (6500K), which has even more blue light than noon sunlight (5500K). You can also choose if the transition from day to night or night to day is fast (20 seconds) or slow (1 hour). I prefer the slow transition as it's not as jarring as the fast transition. It does take a little bit of time to get use to the different color temperature. I would encourage you to give it a couple weeks. I have noticed that I do sleep better since I have started using f.lux. F.lux for mac is amazing. best app I've downloaded for a computer in a long time. Because of F.lux I don't think I can ever use a computer at night again without it. If I use a computer after the sun goes down without #f.lux I welcome someone clawing my eyes out. I've been reminded again that some people don't know about f.lux. It adjusts your colour temperature at sunset. Get it.